The Infographic Revolution: Where Do We Go From Here? By Ally Biring in Culture. Updated on April 10, 2019 . The infographic may seem to some to be a modern phenomenon; but not many know of the true origins and purpose of an infographic. For one thing, it isn’t an invention of the digital medium, it is merely popularized by it. 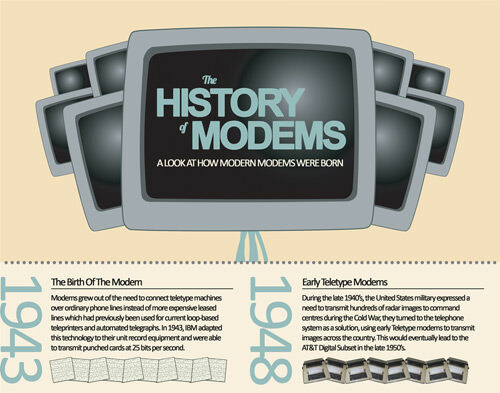 In this article I will be examining the origins of an infographic and how it is more popularly used today. We will take a step back and look at how the data used in these infographics truly enhancing our user experience, and study how much of it is really newsworthy. The are effective, that is for sure. Even the earliest of infographics ever made shows how they are a fantastic way to communicate knowledge. When presented with an oral presentation, the average person would retain only 10% of the information he hears. If however he receives the presentation visually, through a combination of words or graphics, he would be able to retain up to 50% of the contents. While we’re on the subject, on Visual.ly you can find The History of Infographics which features some great insight into the effectiveness of infographics. As I mentioned earlier, infographics are not something new, in fact it has already been put to good use, in print, centuries before. Among the earliest examples of infographics found in print is the following example, taken from the medical report Mortality of the British Army published in 1858. It was created by none other than Florence Nightingale herself. This design is still used today and is known as a coxcomb. 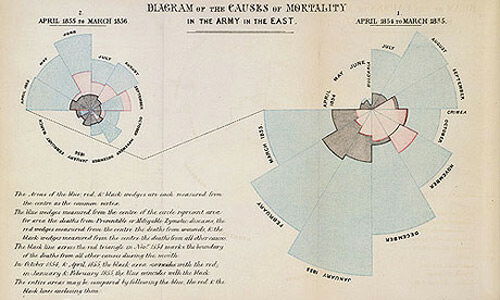 Florence Nightingale often used visual graphics in her reports as she realised they were the most effective way to get her point across, especially when dealing with large groups of individuals, for instance, the Parliament. The next example is an exercise in brand promotion, created by the London Underground. 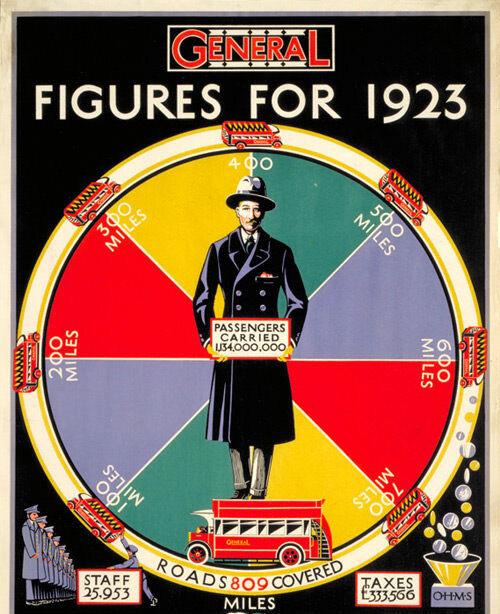 Currently the London Transport museum is holding an exhibition of all their posters, one of the world’s largest collections. The example below reminds us that the challenge of visually displaying complex data in an attractive way is not a new problem. The definition of an infographic according to the Oxford Dictionary is “a visual representation of information or data, e.g. as a chart or diagram”. As we all clearly can see today, iInfographics are no longer confined to print media, e.g. textbooks, public message posters or in business reports. They have evolved to fit into the digital world. The key difference between a print infographic and an onscreen infographic is that we now have the ability to share it with our peers and they with their peers, all at the click of a button. The stratospheric rise of social media has played a part in why infographics are extremely popular these days. Whoever is on the Internet is a potential customer, and we know of the many ways online businesses will try to get their attention: banner ads, Google Ads, email marketing, little viral videos, guest posting, and Share buttons. Whilst it is the easiest to use of the lot, Share buttons aren’t always successful. Sharing a link to a website is great but if you are like me you have a ton of bookmarked, texty, full-length articles which will just remain that, bookmarked. And this is where businesses and brands can benefit from infographics. All they had to do is to take the best elements of each piece of information and put them together, mold it into a final product that is part fun, part enlightening, almost always topical and at times, just for effect, totally pointless. This makes the infographic a joy to read because who doesn’t want to be visually stimulated with bright icons, arrows and colours when digesting bite-sized chunks of information. Best of all, being the first to Share the piece makes one feel pretty cool. Infographics give their producers a chance to re-enforce their brand, market themselves to a new audience, self-promote, show authority in a niche, push more search traffic their way, build more links that lead back to their site and increase overall search rankings. It’s not rocket science how infographics have become such a hot commodity in the online world. The brand is Hotel Club, a hotel-booking company. Their infographic is aimed at travellers who are gamers at heart, and who have large spending power. 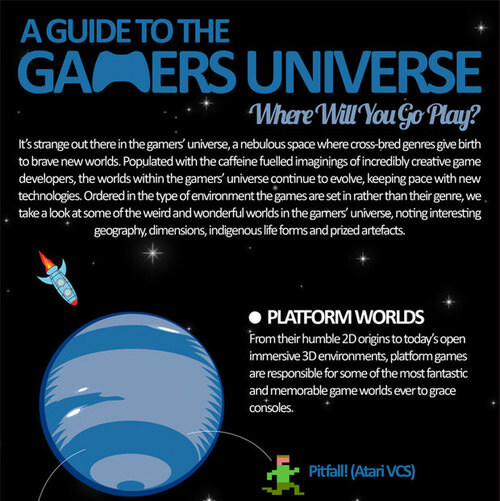 The infographic contains no direct branding but plays on the fact that gamers often embark on their own voyage of discovery while gaming, i.e. by visiting the different worlds their games are set up in. This infographic produced by BroadBandChoices, a broadband comparison site, is a great example of brand promotion. You need a modem for a broadband connection and this company has oh so subtly promoted themselves whilst giving the viewer educational and interesting content about a piece of hardware that plays an integral part of their digital lives. Being an authority in a niche is something that news agencies do very well and the Guardian news agency (from the U.K) is always producing great infographics at break-neck speed. Speed in journalism is key to being considered an authority. Not only are they getting written articles out fast, they are also providing bite-sized alternatives like the above for those who prefer to look at colours and pictures rather than words. 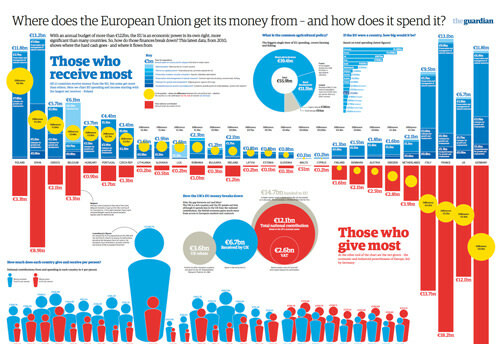 Where Does the EU Get its Money From – and How Does It Spend It? The above are just a small selection of the many different types of infographics that are available out there. A simple search on infographics will easily generate around 8,550,000 results. With the amount of infographics out there, it’s inevitable that not all of them will be well designed or will provide any information that we really need. In fact, is there really a need for infographics to exist when statistics can deliver the message just as easily, or when the information shared just does not really matter? As technology changes, so do marketing methods, and already certain authorities are taking it up a notch with interactive infographics. 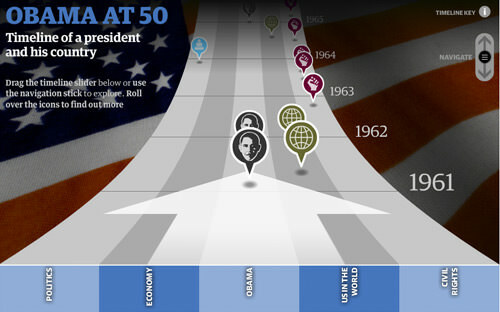 One of the first interactive infographics I came across was one that marks Barrack Obama’s 50th birthday. You get to control the movement of the graphic and which information you wish to look at. It’s worth a look, and a glide, to get a feel of how interactive inforgraphics work. 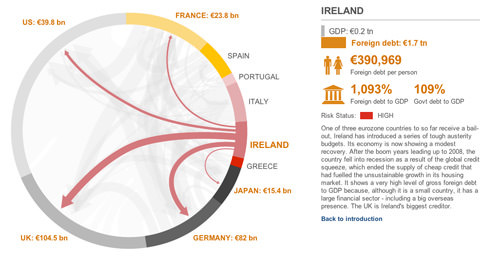 A second interactive infographic, this time created by BBC, shows the debt web of Euro countries and other big world economies. The infographic shows who owes whom money and vice versa, as well as the financial woes of each of the countries. Eurozone Debt: Who Owes What to Whom? Here is another very simple interactive infographic from holiday tour operators Thomson Holidays. 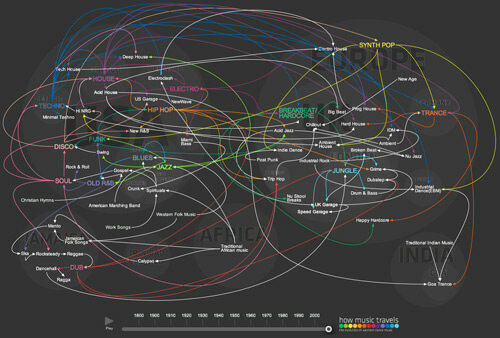 The interactive infographic was designed as a response to the growth in music tourism, to encourage fans of dance music to explore new destinations and music when they travel. Lastly is this interactive infographic from MahiFX. 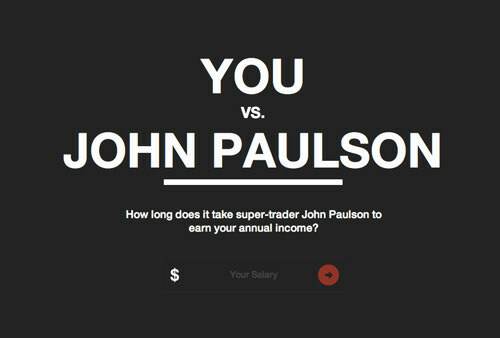 Despite being under construction, instead of a boring landing page, they created an interactive infographic as their homepage where you can enter your annual income and see how long it takes super trader John Paulson to earn your annual salary. That aside, this has helped achieve MahiFX 209 links to their home page 3,866 tweets, 5000 Facebook Likes and 229 Google+ shares. Who knew Forex trading could be so interesting? Editor’s note: This post is written by Ally Biring for Hongkiat.com. Ally is a graphic design graduate interested in print design, typography and all things web. She is also a blogger with SEOGadget.co.uk.